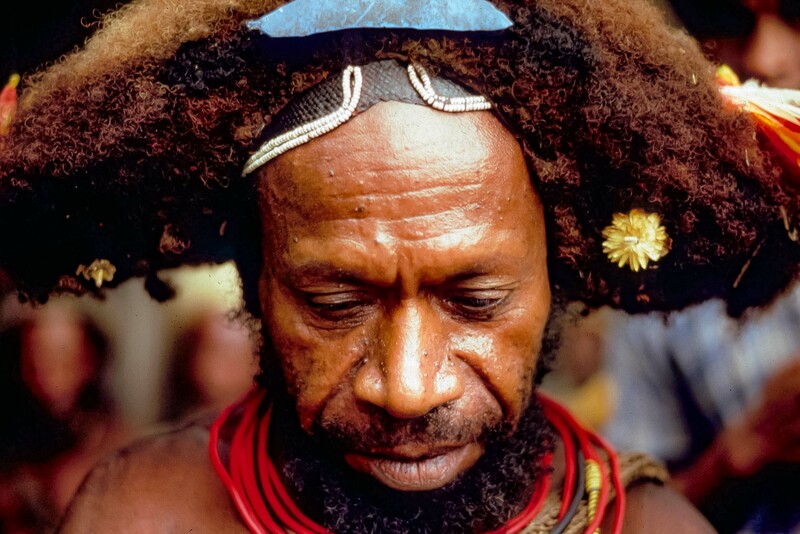 Papua New Guinea, Huli Wigman 2 Koroba, 1983 - On the far right of his wig, there are red and yellow candy wrappers. The wigmen seemed to accept any items that were to them beautiful, without regard to new or old, synthetic or natural. They were both artists and living art. They were creative. They might have been trying to emulate the bird of paradise. The male bird of paradise is the one with spectacular plumage. This is used to attract the female. I dismissed my previous conception that interest in adorning the body was primarily a female trait. Many of my perceptions were dramatically altered as a result of being in contact with these exceptional people.